Unlike the maps based on the Mercator projection that distort the relative sizes of countries and continents, Krause’s map puts size into a more proper perspective. For example, on maps based on the Mercator projection, Africa appears the same size as Greenland when, in reality, Africa is 14 times bigger. Krause makes his point by placing the outlines of other countries within the borders of the African continent. The impact is sobering. 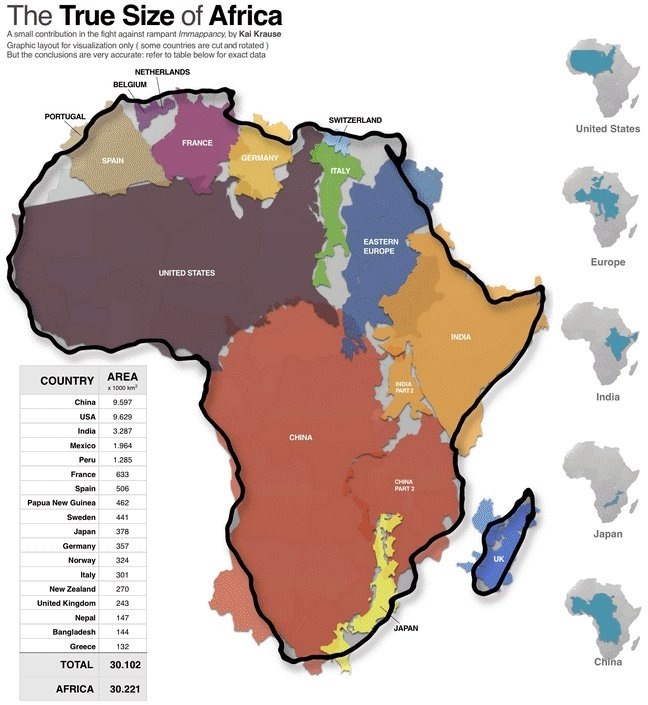 Africa is huge! Krause is on to something. Immapancy is something that should concern us as much as illiteracy and innumeracy. In spite of all of the cartographical resources available to us today, I don’t know how many times I have heard people refer to Africa as a country instead of a continent. If we are to understand the world in which we live, then we need to foster a better understanding of geography. A good place to start is by looking at a map of your own town in order to better understand the context in which you live. Then, expand to increasingly larger areas so that you can broaden your understanding of the relationships between countries, oceans, deserts, and other landmarks. Make it a point to become familiar with the shapes and characteristics of continents and countries on the planet. And, when you hear a place mentioned on the evening news, look it up on a map and fix its location in your mind. These are just a few simple steps that can help anyone to overcome immapancy — one country at a time. Gosh, Omar, it must be biggern Texas! Love this! Thank you for sharing it. The boys are studying Africa in geography this month. They were shocked when I showed them the graph. 🙂 Have you heard of Geopuzzles? Map-puzzles of each continent, with pieces shaped like countries. They are helping us all improve our world geography in a fun way. Kudos for teaching your kids about geography in creative ways. Have not seen the Geopuzzles but they sound like a great teaching tool.